Who are the Breakers MVP Candidates? The Sky City Breakers Awards night will be held next Friday when the team, management, sponsors and supporters will celebrate the club’s fourth NBL Championship in five years. But who will take out the club’s MVP Award? We examine the merits of the five premier contenders. 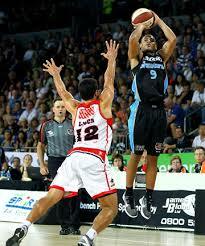 First up is Corey Webster the maverick shooting guard who has enjoyed a breakout season in the NBL. As one who has followed Webster’s career since his primary school days there has never been any doubt about his ability to rack up points in a hurry. Webster has just finished his 6th season with the club, easily his most productive. His first two years were spent as a Development player before signing his first full time contract in 2010-11. During those first five seasons Webster was very much a bit-part player providing the coaching staff with scoring punch behind established performers like Kirk Penney, Kevin Braswell, CJ Bruton, Daryl Corletto and Cedric Jackson. His scoring output did increase over the seasons but not at the pace he would have liked. 7.6ppg in 2012-13 to 8.5ppg in 2013-14 has been followed by a quantum leap this season. Entrusted with a starting spot by coach Dean Vickerman, Webster has repaid the faith with a team high 491 points at 15.3 points per game. Webster’s first outing of the season wasn’t overly encouraging, he managed just 4 points in Perth as the Breakers toppled the defending champions 80-70. Webster shot just 2 from 7 that night but 7 days later at Vector Arena he knocked down 23 points against Adelaide and his season was up and running. 23 points equaled his Breakers career high, a figure he would better three times during the season culminating in a 27 points haul in the second victory of the season in Perth, the game remembered mostly for the Cedric Jackson buzzer beater from his own half. That was followed by a team high 24 points against Adelaide in Semi-Final Game 1, his seventh 20+ points haul of the campaign. Although Webster only averaged 11.3ppg in the final three play-off games he still contributed mightily to the Breakers cause. In each game he helped the Breakers get on the front foot with a fast start. In addition his defence on the likes of Scottie Wilbekin and Adam Gibson was solid and in Semi-Final game 2 he snared a career high 5 steals. Once known for simply being a terrific scorer, Webster has made great strides in the last few seasons, becoming a much more rounded player. On the back of an outstanding FIBA World Cup campaign, his latest Breakers season has reaffirmed his rise as one of New Zealand’s premier players. Not only will he be amongst the front-runners for the Breakers MVP Award for the 2014-15 season he will surely be a certainty for the Most Improved Player.